When an employer or a concerned parent needs to see the full picture of drug abuse, then this test will give them the answers required. Perfect for situations when you need rapid results while saving a visit to the lab. Possibly the most affordable and comprehensive test available, offering the ability to screen 13 substances at once with high accuracy, it’s defined as a rapid, one-step device that detects multiple drug metabolites simultaneously from a human urine sample. A straightforward test with results in less than five minutes. It has all the benefits of a urine drug test but without the expense of a laboratory, and allows you to test time after time without breaking the bank. This product is for Forensic use only. Seven illicit drugs Amphetamines, Cocaine, Ecstasy, K2-Spice, Marijuana, Methamphetamine, Opiates and six prescription drugs Barbiturates, Benzodiazepines, Buprenorphine, Oxycodone, Propoxyphene, Methadone. 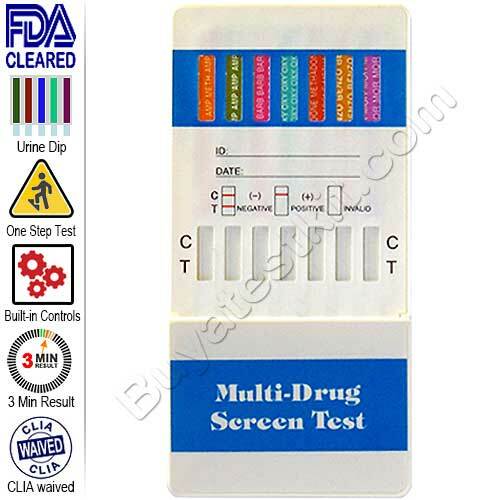 In conclusion, not only does this favorite test kit detect commonly abused illicit drugs, but prescription drugs such as oxycodone and K2-Spice too, making this the ultimate urine test kit. The top of the card has color-coded panels, and on this test, they are on both sides. Each color represents a particular drug with abbreviations written on them. Example abbreviation is COC for cocaine. Collect a clean sample of urine from the donor. 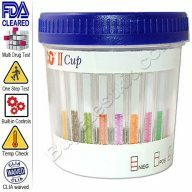 We recommend that you use a specimen cup with a temperature check. Upon collection, monitor the temperature. Establish it is between 93 to 98º F., if not ask for a fresh sample and continue with a new test. Remove the test kit from the sealed foil pouch and remove the cap. Insert only the tips of the fingers protruding from the device into the urine. Do this for 20 seconds. Then lay the device on a flat, clean surface. At this time you can replace the cap. Watch as the device develops, this will take around two minutes. Each test contains a built-in control feature, the (C) line. The presence of the (C) line indicates that an adequate sample volume was used and that the reagents migrated adequately. If a (C) line does not form, the result is invalid. Discard the device and start the testing process with a new test kit. The control line (C) serves as an internal quality control to establish the test was successful. The colored band will be visible regardless of the test detecting a drug. When no (T line) is visible, the drug concentration is at or above the cut-off limit, and so it is presumed a positive result. When there is no drug or the drug concentration is below the cut-off limit, the (T line) will be visible. When the (T line) line is faint, the result is still Negative. Note: Presumed positive results should be confirmed with a lab test using the sample collected. 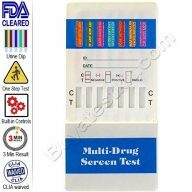 Included in each 13 panel drug test box are instructions in the form of a data-sheet, you can also download a copy by clicking the links below. Learn more about drug abuse. Identify the signs of drug abuse. How long does a drug stay in your system?